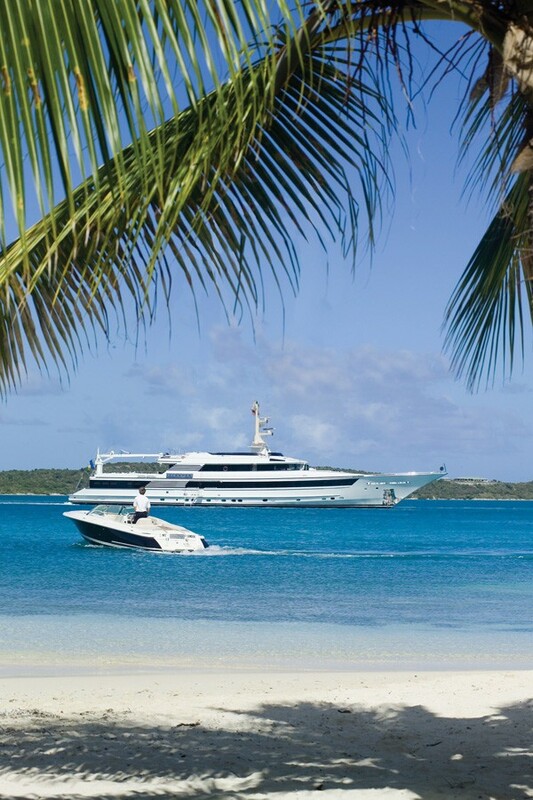 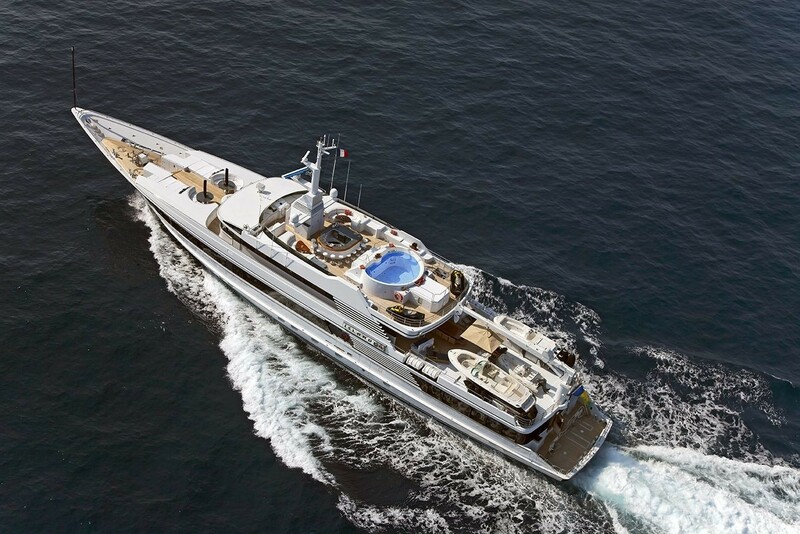 Yacht FAM (previously called Islander) is a large motor yacht measuring 58.52m (191' 11") in length. 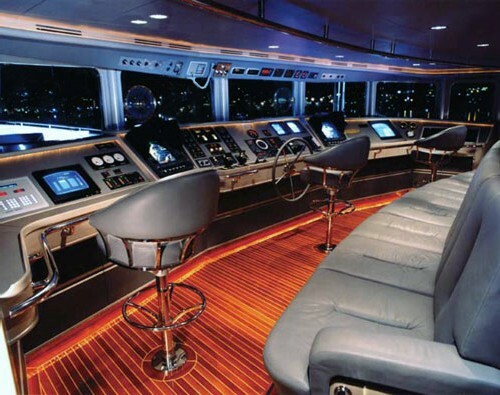 The yacht Islander was built in 1991 by Australian Yacht Builders as a sailing yacht and in 2008-2010 her masts were removed and the yacht was converted to a motor vessel. 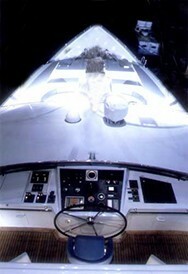 During her rebuild, motor yacht FAM was re-stabilized and a new radar arch was installed over the fly bridge. 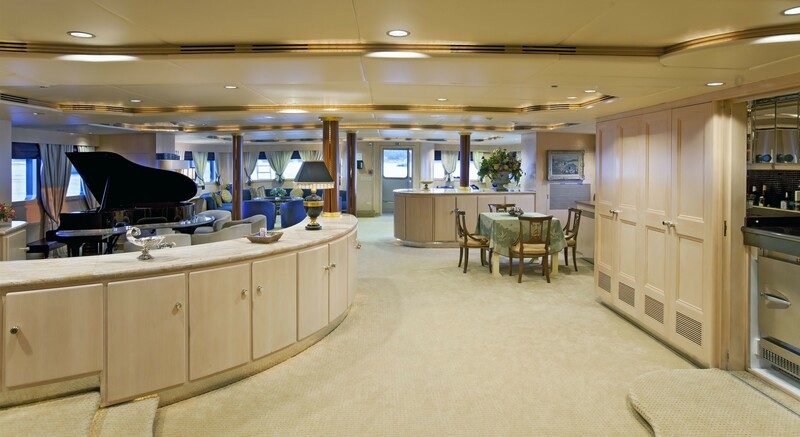 She also received new electronics, new communications systems and a full repaint as well as re-carpeting of certain areas, such as the salon, master stateroom, guest’s cabin, and the replacement of upholstery in some guests cabins. 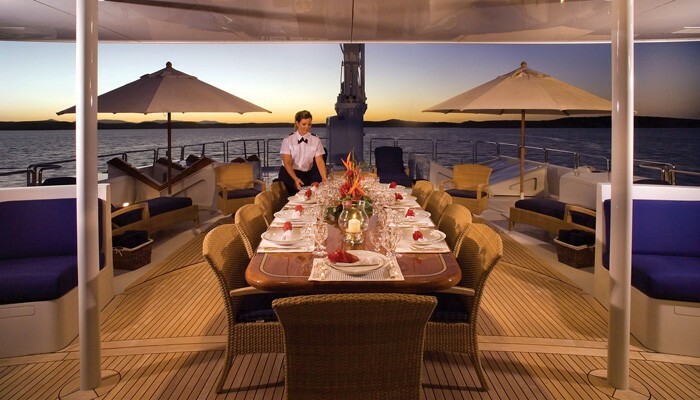 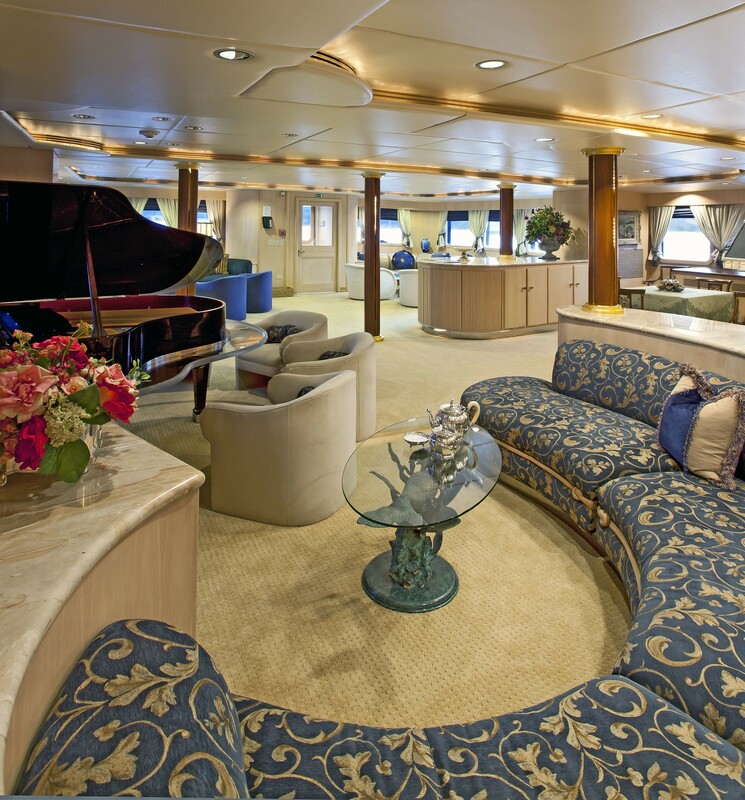 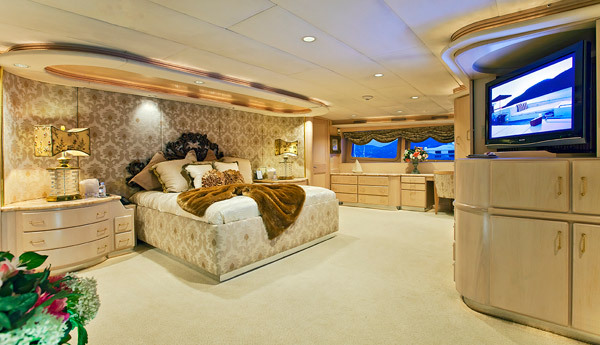 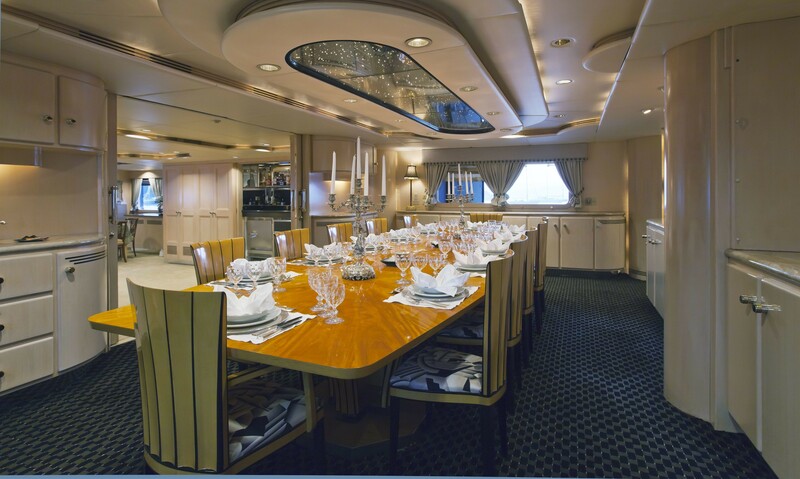 Yacht Islander has an understated opulence and boasts an unbelievable amount of space. 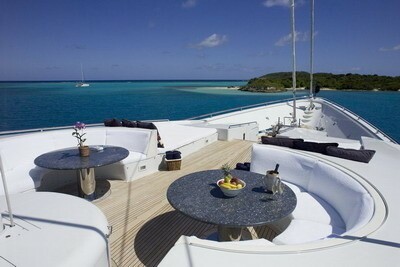 With a beam of nearly 36 feet, M/Y Islander has a massive interior volume and huge on deck areas. 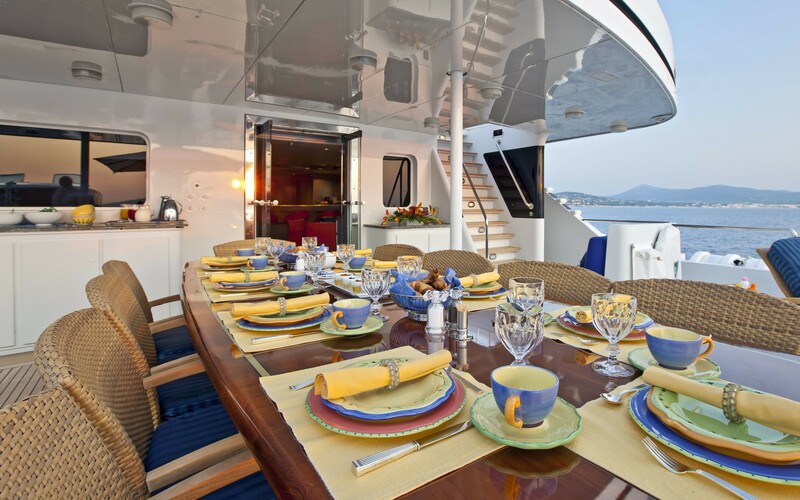 The yacht was built with world cruising in mind, and is fitted with every amenity to ensure a comfortable and pleasurable charter. 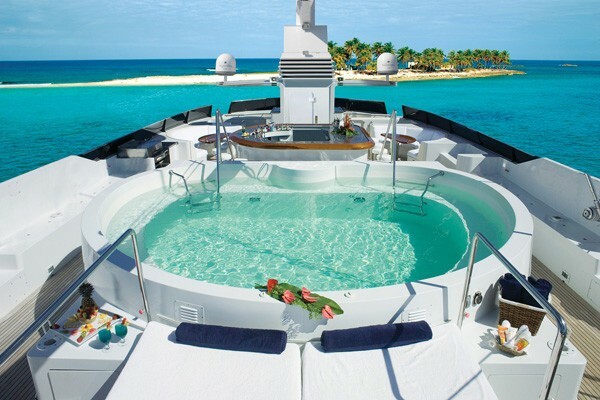 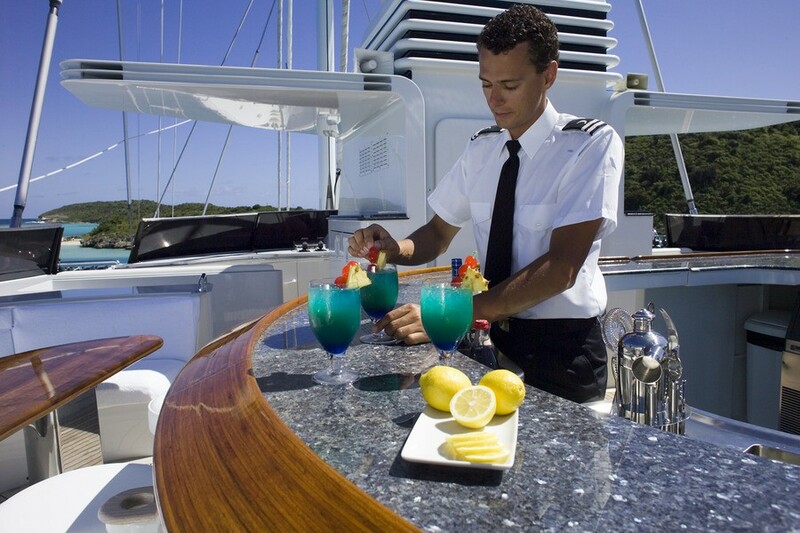 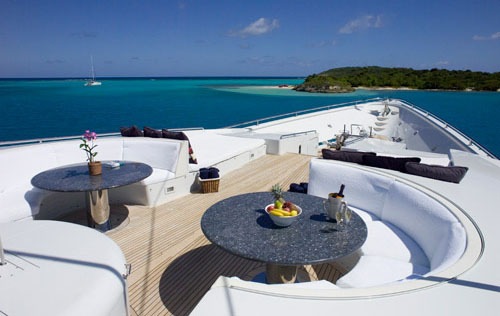 The Sun Deck on board the islander yacht is immense and features a heated pool with whirlpool jets, large sun pads, a BBQ and a fully-equipped bar that can accommodate 12 charter guests. 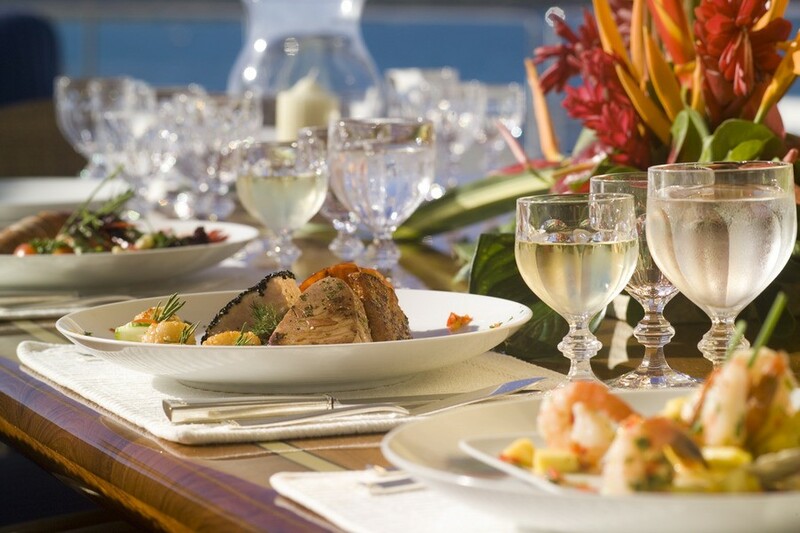 The yacht is also equipped with a range of water sport toys including tenders, wave runners, a windsurfer, kayaks, snorkel and scuba gear, and inflatable water toys. 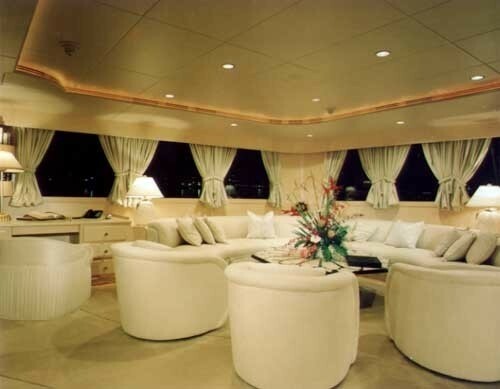 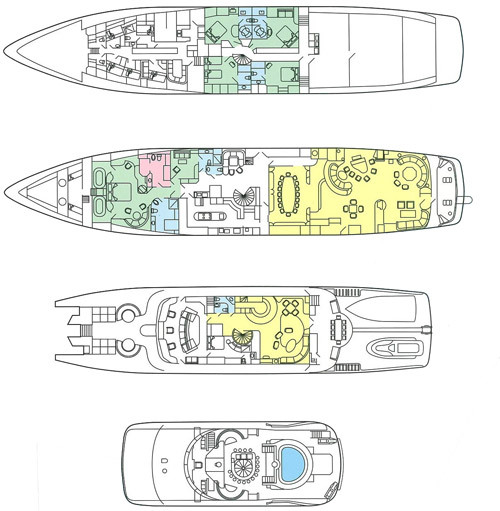 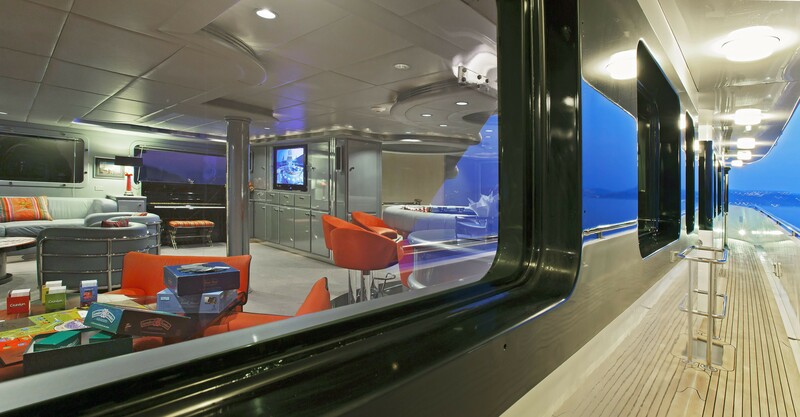 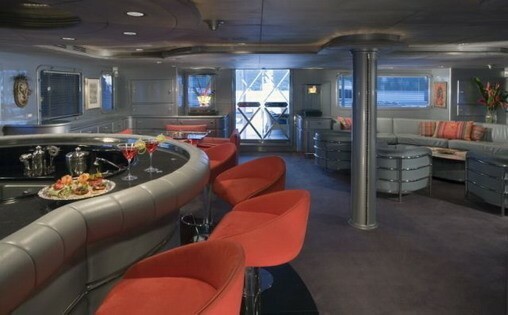 The interior of the superyacht Islander is magnificent. 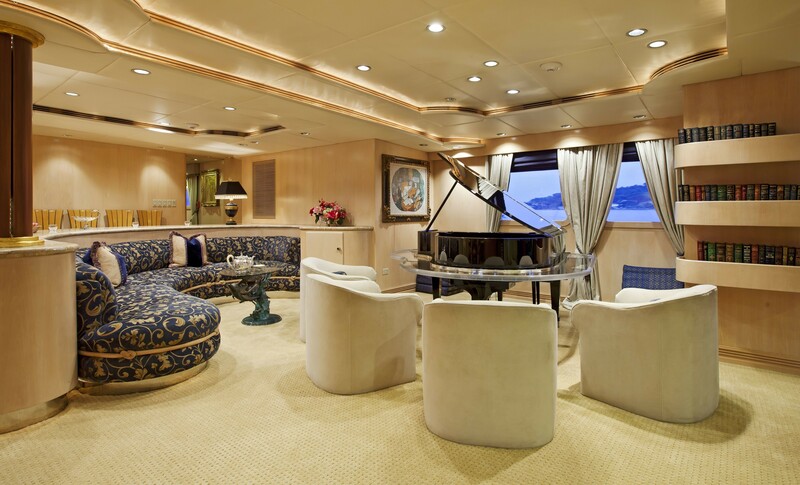 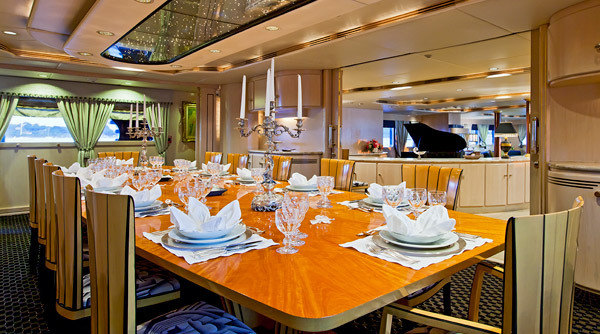 The Main Saloon runs the full width of the ship and provides four different seating areas where guests can enjoy gathering around the Steinway grand piano, playing at the game table, relaxing in the conversation areas, and enjoying the entertainment system. 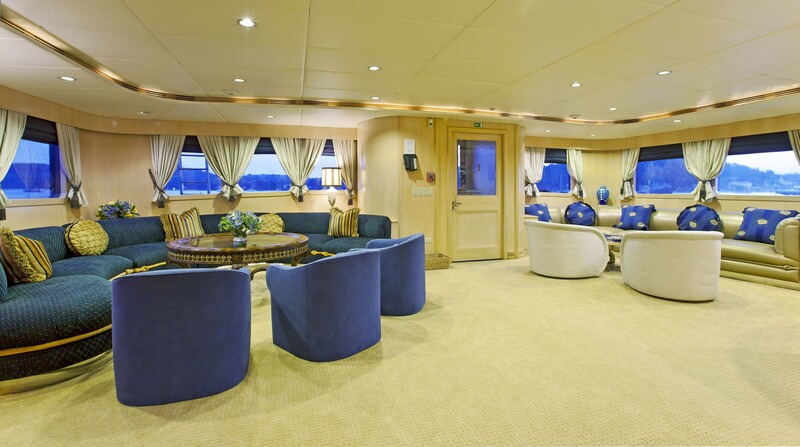 A delightful selection of artwork is complemented well by the Queensland silver ash woodwork and the dramatic spiral staircase off the entrance lobby amidships is a grand feature that soars up three decks. 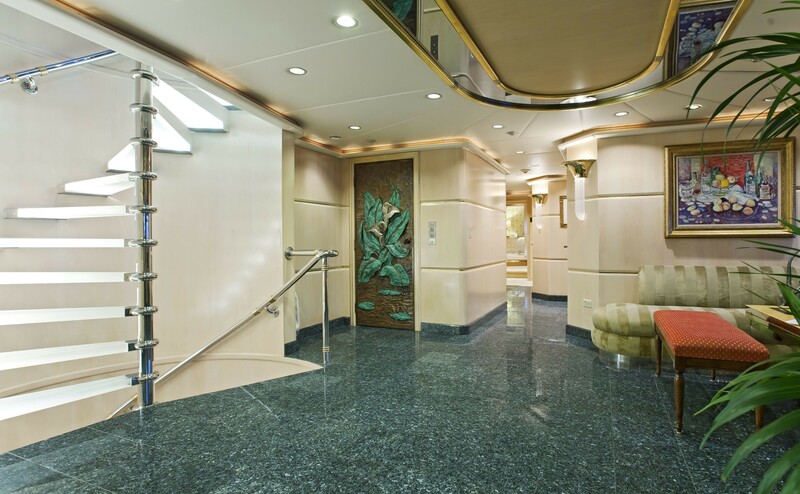 The steps of the staircase are illuminated from within as well as above by a commissioned artwork of stained glass. 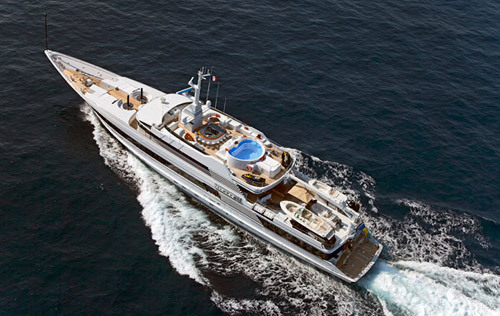 A full-size elevator services every level making Islander a wheelchair accessible superyacht. 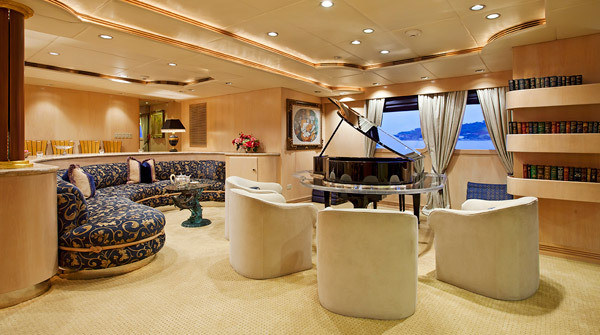 On the upper level, M/Y Islander’s Sky Lounge is especially attuned to night time entertaining boasting a sophisticated bar, Yamaha piano, leather settees and chairs, card table, and entertainment system with flat-screen television. 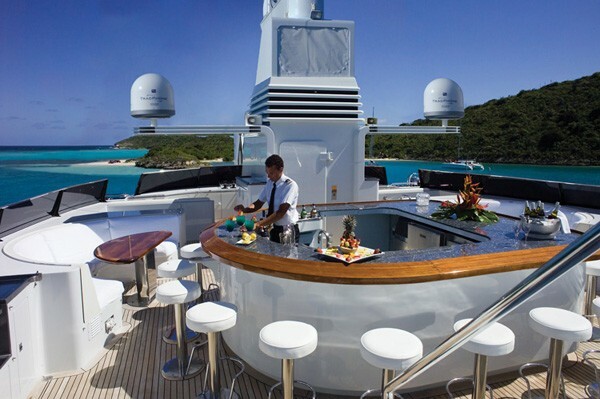 Aft of the Sky Lounge there is a large al fresco dining area that provides breath-taking panoramic views, complemented by cozy conversation areas for cocktails. 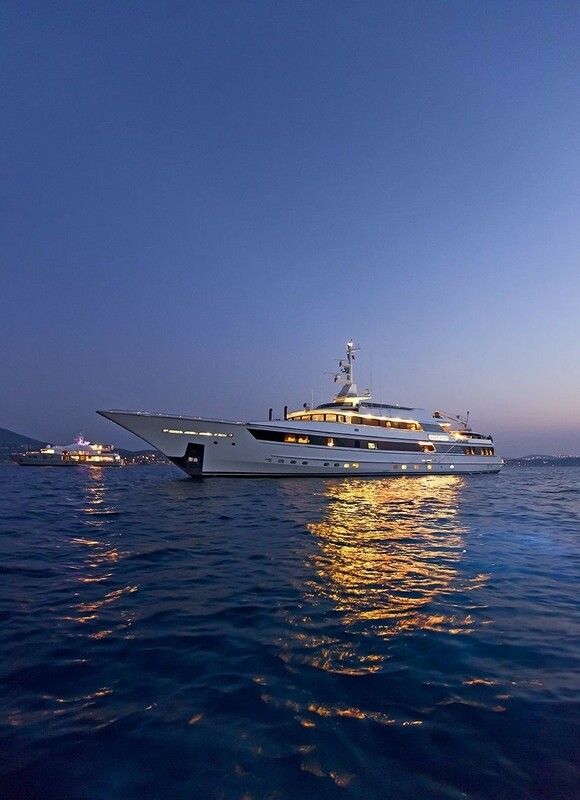 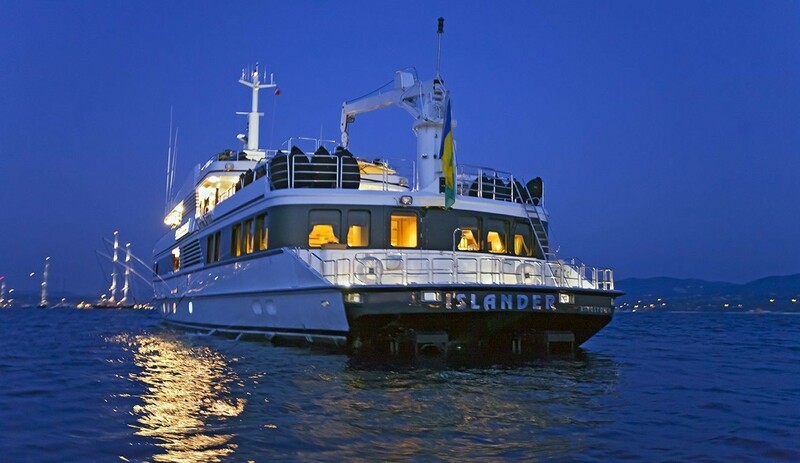 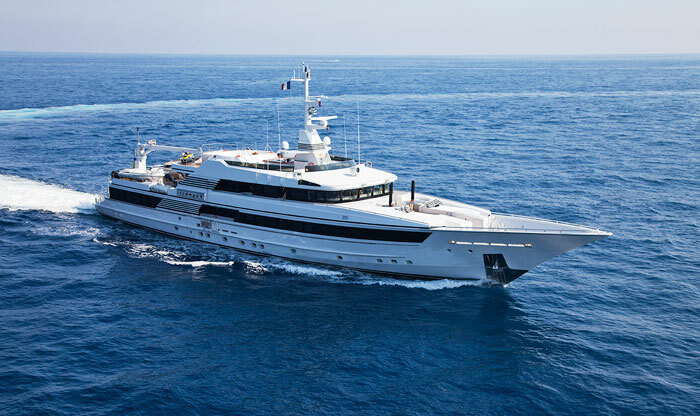 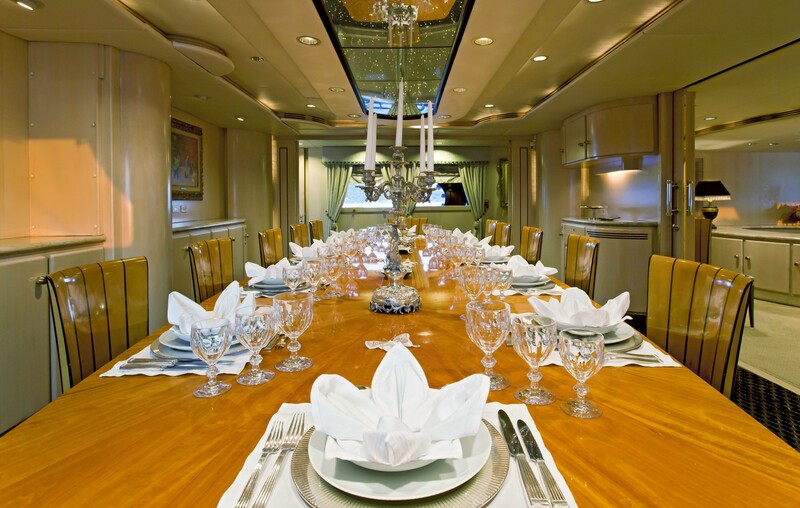 Motor yacht Islander is able to accommodate up to 12 guests in 6 staterooms including 4 double cabins, one twin cabin and one convertible cabin. 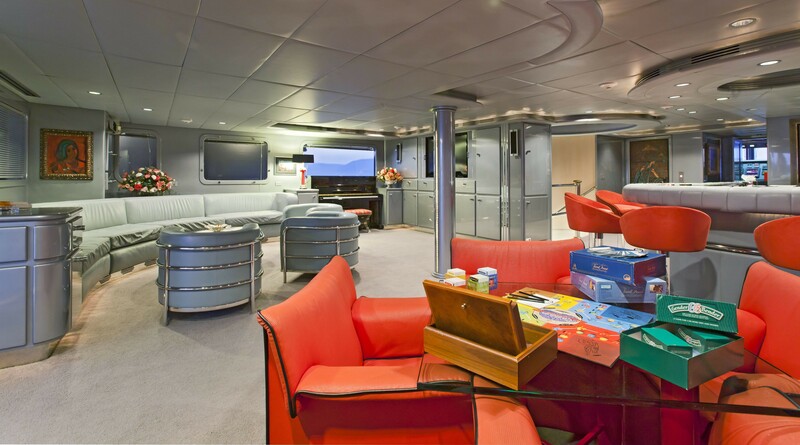 The full beam master cabin is completely private from the rest of the ship and is generously proportioned with ample storage, a seating area, and full entertainment system and plenty of natural light from over sized windows. 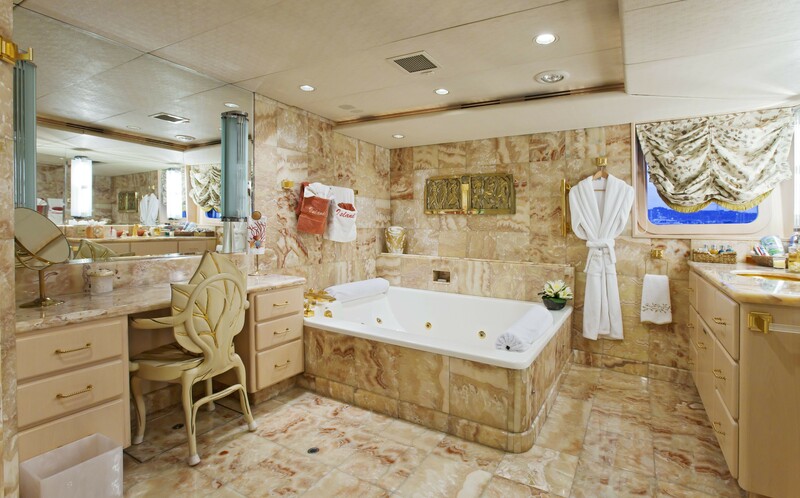 His and her bathrooms are finished in honey-colored marble, His featuring a large shower and gymnasium equipment that includes treadmill, weight bench and bicycle. 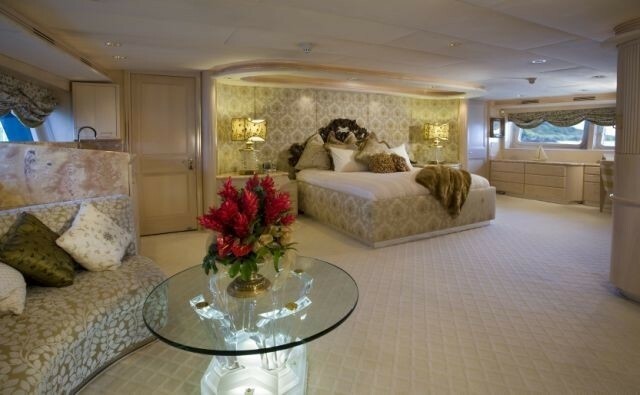 Her bathroom features an over sized whirlpool bath and separate marble shower. 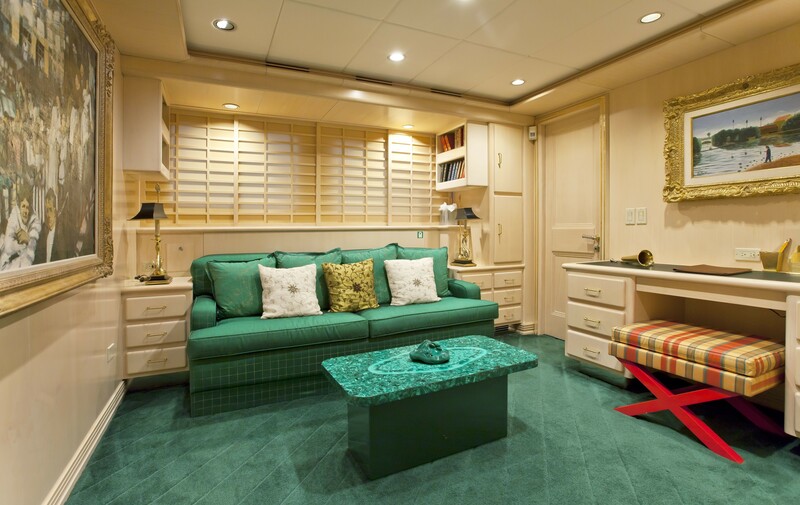 There is a separate Owner’s Study with a couch, desk, television and private bathroom finished in marble and granite. 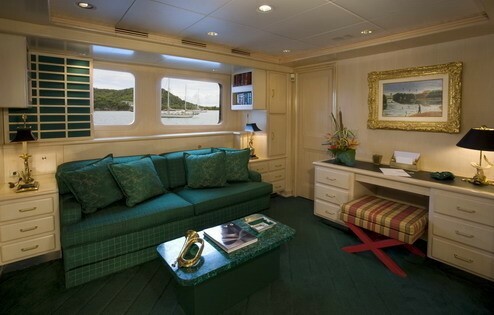 If desired, the Study may be converted to a double guest cabin for a personal assistant, nanny or children. 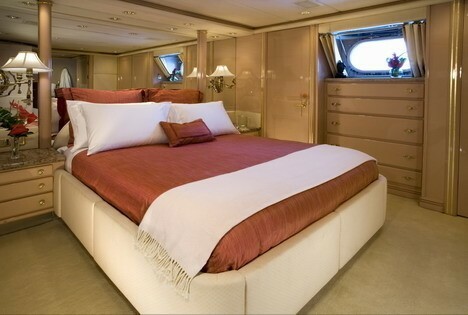 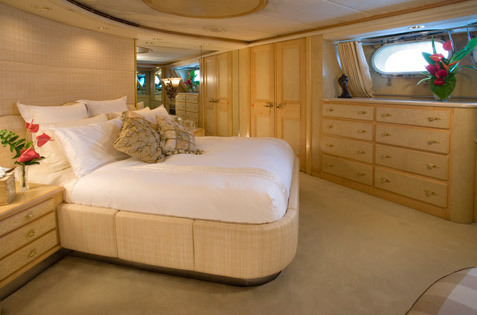 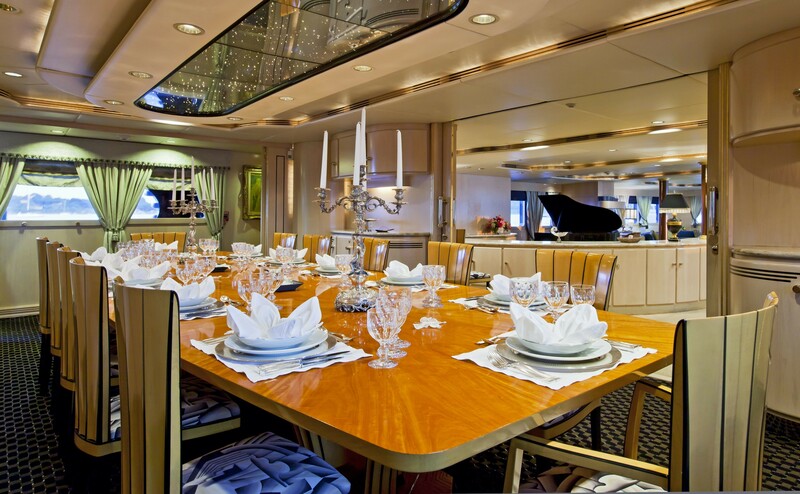 Four guest staterooms, including three queen staterooms and one with twin beds and a Pullman berth are located on the lower accommodation level of the charter yacht Islander. 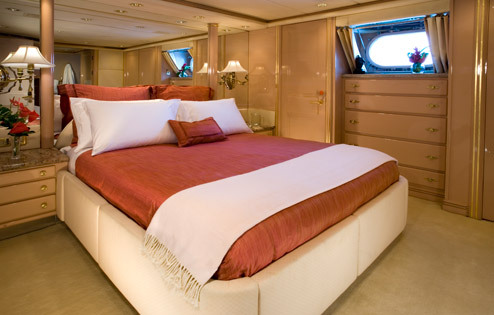 Each has an individual design yet are equally luxurious. All are artfully arranged with marble finishes, full entertainment systems, storage, and en suite facilities. 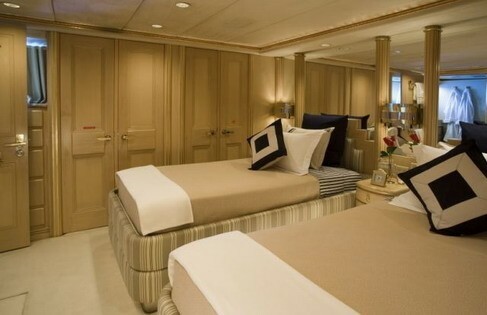 Two of the queen cabins have over sized whirlpool baths. The FAM superyacht allows maximum guest comfort with exceptional space with an interior that is light and airy with excellent natural light. 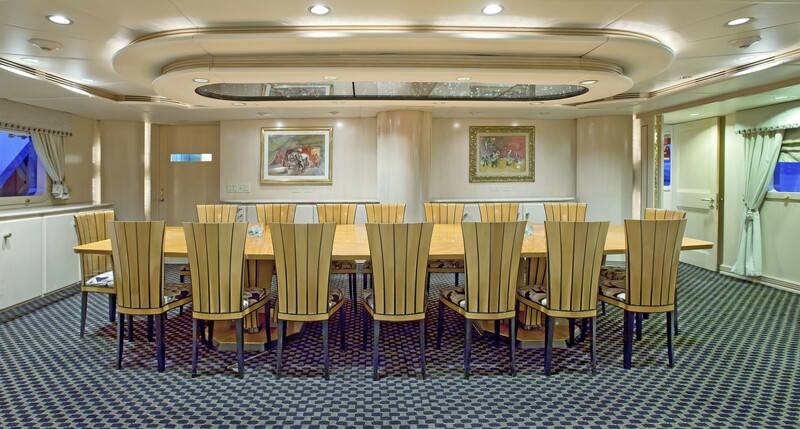 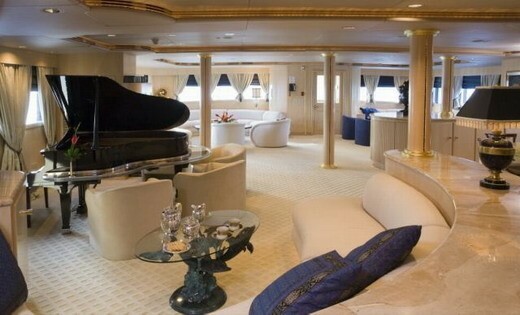 FAM can accommodate a total of 10-12 guests in 6 cabins. 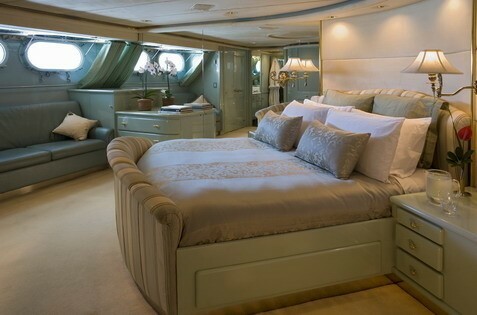 Her Owner's suite has a spa pool bathroom en suite and shower room en suite as well as a totally private study which converts to an additional double cabin with sofa bed and shower room en suite with separate entrances. 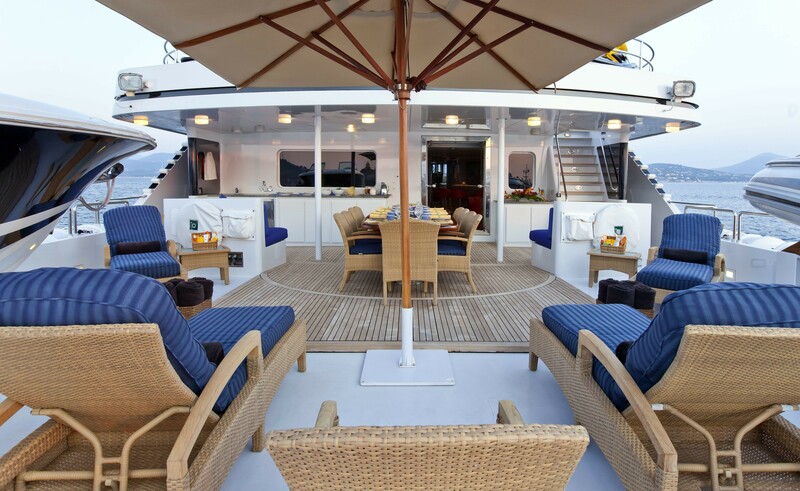 There is an additional two double cabins with spa pool bathroom en suite, a double cabin with bathroom en suite and one twin cabin with bathroom en suite. 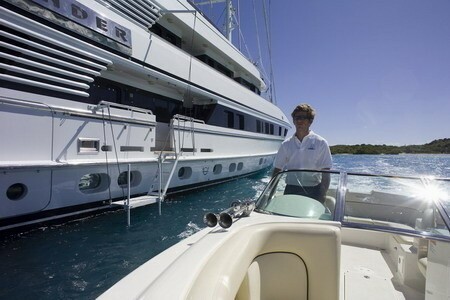 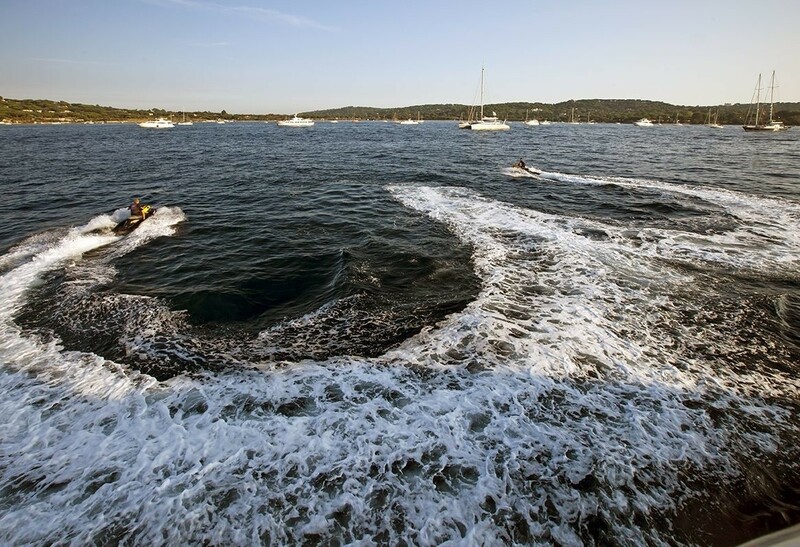 M/Y ISLANDER is equipped with a range of Tenders, Toys and other amenities including a 25ft Chris-Craft 25 ft Diesel Launch with D4-210A Volvo engine, a 22 ft Novurania with 280hp engine, am AB Crew Tender with 25hp 4 stroke Yamaha, 2 Seadoo waverunners, a Kayak, Waterskis and tows, Snorkelling gear as well as Scuba equipment. 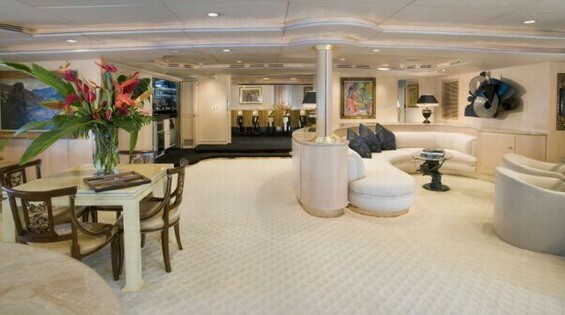 There is Gym equipment in owner's suite. 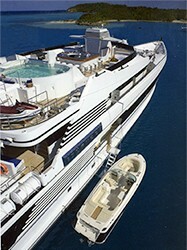 On deck there is a 20' x 10' pool with spa pool jets and counter-currents. 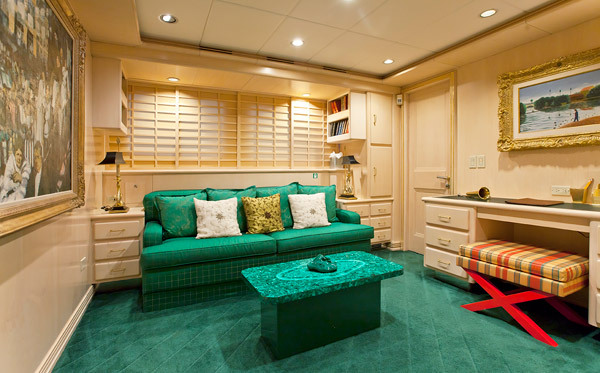 M/Y ISLANDER also boasts an elevator to all deck levels, TV, videos and DVD and stereo systems in each cabin. 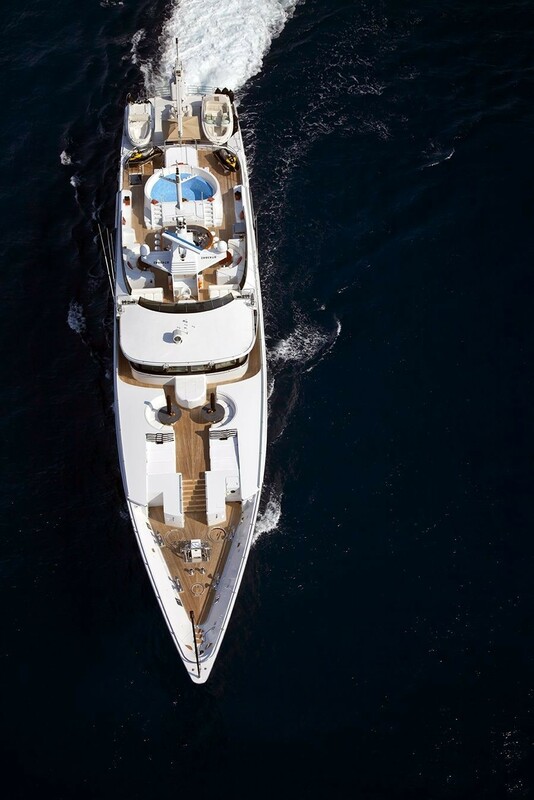 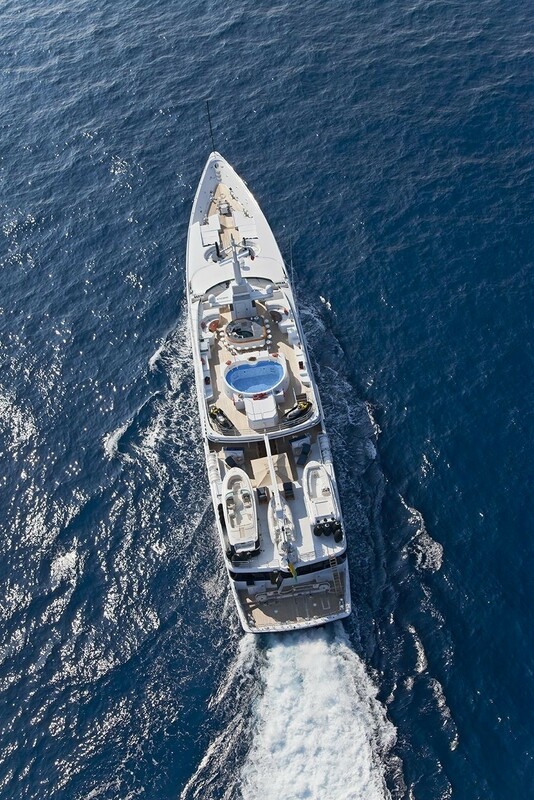 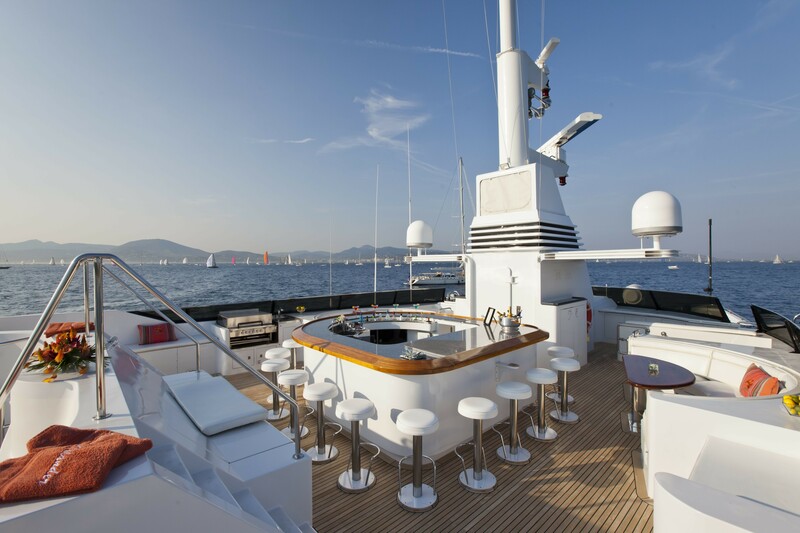 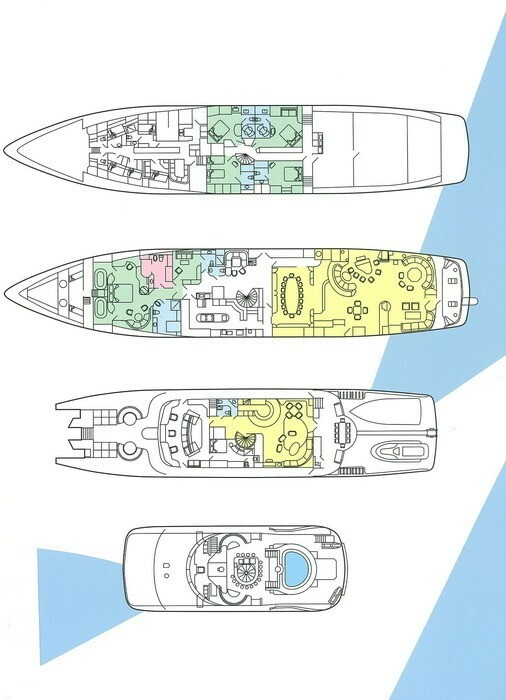 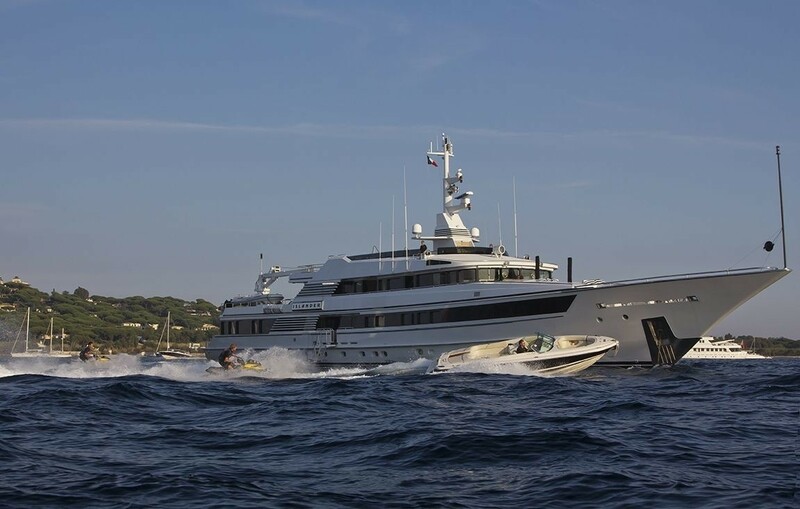 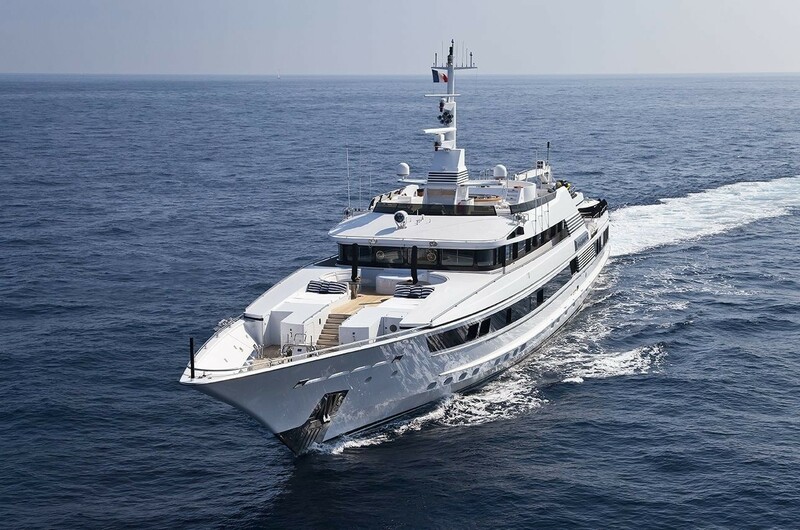 Communications onboard the yacht include a Satcom A, Satcom C, telephone,telefax, e-mail), a Seatel satellite TV system and a Hugues HNS9201 BGAN Satellite internet Syrens Geosat EC-01/HP High Performance Mobile WiFi booster.